Front room of Kielder 1. Picture above: Front room for Kielder 1. We have two static caravans for hire. Both are TWO BEDROOMED. We require a minimum stay of two nights. However, during July and August we require a 5 night minimum stay. Please note our caravans are pet free. Picture above: Kitchen in Kielder 1. Both of our caravan's have two bedrooms. One double, one twin. Fridge with small freezer compartment. Free Sat TV, DVD player and radio stations. Gas fire and electric heaters. Visitors are requested to bring quilt covers, pillowslips, sheets & towels. Notes for your arrival: The warden may not be on site when you arrive. Location of your booked caravan can be found on the office noticeboard, with an information folder in the caravan. 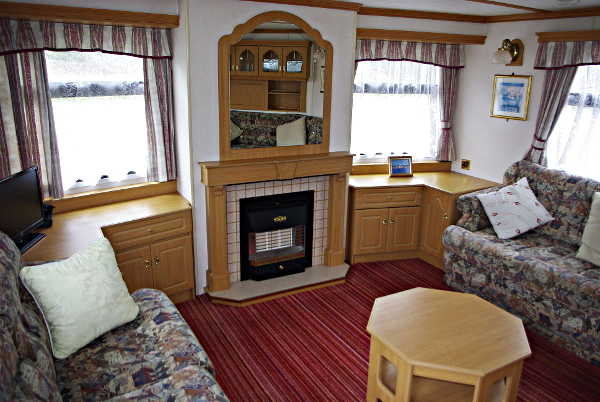 Caravans are available from 3.00 pm on the day of arrival. Please inform if you are arriving later. Picture above: Dining and front room. Kielder 1. Picture above: Double bedroom. Kielder 1.